Here at the Group Real Estate, when we aren’t out listing homes and helping our clients, there are plenty of fun activities and places that we love to go and enjoy. One of these places is Heise Hot Springs, in Ririe, Idaho. A wonderful place to relax and sit in the natural hot pool, splash around in our warm pool, play and jump off the diving board at our Summer pool, or have fun braving the 350 foot water slide. 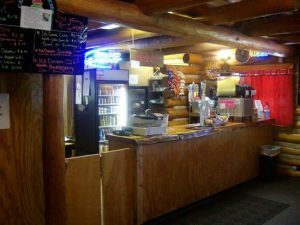 There is also the Zip Line, Heise pizza, a golf course, South Fork of the Snake River expedition, and RV/Camping sites. Heise Hot Springs has a natural hot springs kept at a temperature of about 104 degrees. It is the perfect spot to go to soak in the hot pools, for sore muscles and joints, a perfect spot to sit and relax, and a great place to come and enjoy some great pool time. The pool is set up around 92 degrees and it fresh water, with a shallow to deeper part, this is the perfect spot for kids to come and enjoy the pools with their parents. During the summer months, the degrees are changed to about 84 degrees, between Memorial Day and Labor Day, making it the perfect spot to come cool off and enjoy the diving board, swimming laps, or just having a great time with family and friends. During the summer time, there is a 350 foot water slide and is a great time fro both kids and adults. After a full day of swimming and having fun with your family and friends, you are sure to perk up an appetite. There by the pool they have everything from onion rings to nachos. In the indoor area near the pool they offer their famous Heise Burger and serve milkshakes and soft-serve ice cream. There are both indoor and outdoor eating areas. In the mood for some pizza after you are done swimming? The Heise Pizza Parlor is located right near the swimming pool. They have gluten free options, they sell off gift cards, and they have been perfecting their “legendary” pizza, including specialty pizzas. There are many locals, who come up to Heise just for the pizza. It’s right near the golf course, and has a lot of outdoor seating where you can enjoy the view as you enjoy a slice, or two, of pizza. 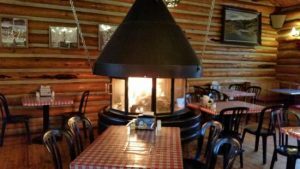 In the winter time, there is a great indoor ambiance, that has a wood burning stove where you can enjoy the pizza and feel the great warmth of it. There is dine-in, as well as carry-out. If you are looking for fun an adventure, in an adrenaline fulfilled way, look no further than the Heise Zipline tour. There are ten separate ziplines which cover almost a mile of terrain through the mountains. Experienced guides will give a brief orientation, they get you geared up for safety, and take you ona short ride up to the first zipline in an awesome utility vehicle. Each zipline varies between 300 to 1400 feet in length. Plan on spending a great three hours, depending on the size of your group, for this fun adventure. You are able to do the zipline at night, through the winter times, and they do a great Full Moon tour, where they make sure to get reservations during the full moon, zip lining underneath the stars and the full moon! This year you are able to have fun and some great scares on the Zipline, the Haunted Tour, runs at night from 7:30 to 10pm, as weather permits, every Friday and Saturday. As you go to check in, you don’t do it at the lodge, you go to a campsite, where you then traverse through the “haunted forest” filled with ghosts and goblins, on your way to the first zipline. Not only are there spooks and scares, from chainsaws to goblins, at the beginning and ends of each zipline, but you are fully immersed in the dark going through the tour. There are many different reasons to bring you to Heise Hot Springs. These are just a few of the great reasons to show up to Heise Hot Springs. 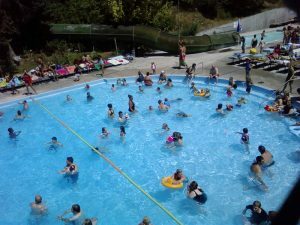 Not only is the hot pool the place to be, the place to go, but knowing you can choose the zipline as a great adventurous place to spend your day, then finish it off with some great pizza and camp out for the evening with your friends and family.